SATURDAY: I had a few things to do before Deb and I headed down to TCAF. Because I was only going to be there for a few hours my report is truncated significantly. 2:30-2:45. Arrived. What’s with the construction blocking the one entrance? Interesting that there’s a girl handing out flyers telling people to go The Labyrinth for Free Comic Book Day right outside the main door. Good Lord — there are too many people here on the main floor. I can’t move down any of these aisles to look at anything. The Chester Brown line is HUGE. Noise level is insane. Librarians must be in hiding. 2:45-3:15 Nice to see Scott Chantler and the guys from Transmission-X and Kill Shakespeare. Couldn’t move around to see anything/anyone else. Scott made a print out of the D-Day double-splash from Two Generals that I bought from him last fall. 3:15-4:30 Decided to go to the Canadians in the Mainstream panel at 3:30 at the Pilot Tavern. Why is there a celtic band playing while the panel is going on? Anyways — beer, Darwyn and the Immonens plus McConnell, Fawkes, Jillian Tamaki. Special guest Ken Steacy. Special non-guest: me. I gather the consensus was that being Canadian in comics doesn’t mean much except that one feels slightly different when in a room with Americans because we are more aware about what’s going on in the rest of the world, there’s a slight detachment but creatively everyone strives to be an individual and do their best and that’s universally true. Some felt that there’s a definite “can do” spirit here because of the smaller population and lack of resources. All agreed there is no comics industry per se in Canada, that working with international publishers is their economic choice, but that because of the rising Canadian dollar against a falling US dollar that they’ve all had to take a significant pay reduction. Americans don’t seem to grasp the concept of currency exchange and geographical perspective. Toronto, for example, is not near Vancouver. 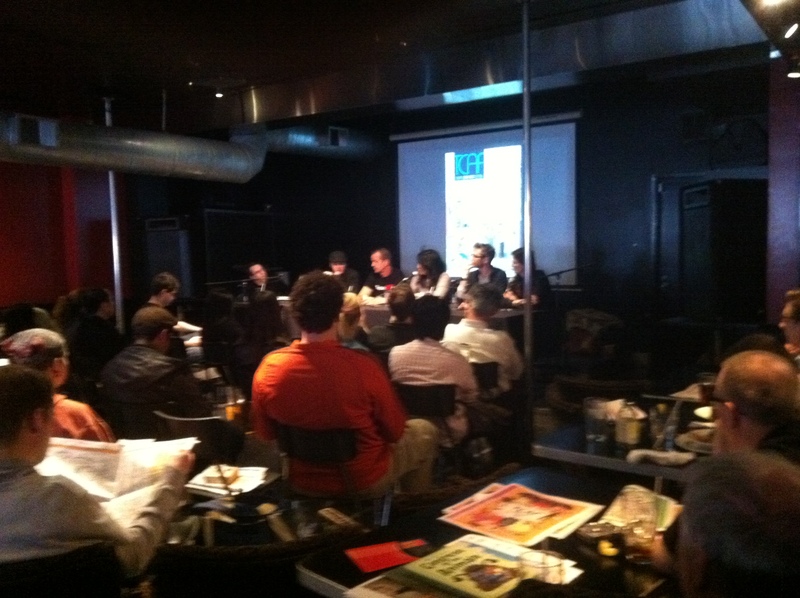 My view at the Pilot - from L to R on stage: Robin McConnell, Ray Fawkes, Darwyn Cooke, Jillian Tamaki, Stuart Immonen, Kathryn Immonen. Ken Steacy's head is just on the lower right, second from the bottom. 4:30-4:45. Panel ends. Nice chat with Darwyn about the awards and we head back over to the library. 4:45-5:15. Show ends at 5. Really? 5? Barely enough time to go back in and look at anything. Ran into Rob and Jenn, Tyrone and Alana McCarthy and J. Torres. Had a nice chat about venue problems in Toronto. Talked briefly with Andy from Conundrum. 5:15-10:30. After the show closes: off to dinner with Robert and Jenn, Ross Campbell and Scott Chantler. We went to the slowest restaurant on the planet: The Ethiopian House. My innards are still complaining. I think the waitress is still getting us more water. No Wright Awards for us this year. 10:30-1:30. TCAFete at Pauper’s Pub after dinner. Great fun. Best $5 spent all weekend. Saw and talked with a lot of comics folks. End of Day Thoughts: TCAF has outgrown the library. If they want to keep the venue viable the library has to close down during the 2 days that TCAF is on, extend the hours they re open, and move more things out of the way. It was too crowded and virtually impossible to browse the tables on the main floor on Saturday. Everyone is in great spirits though. Purchases during show hours: 1 Mill Street Tankhouse Ale at the Pilot. $8.50 with tip. 1 copy of Sequential Pulp III: free. Hope to see something to buy on Sunday. This entry was posted in Happenings, Op/Ed, Other Awards, Publishers by Kevin A. Boyd. Bookmark the permalink. “I think the waitress is still getting us more water” made me laugh out loud. Funny because it’s true.